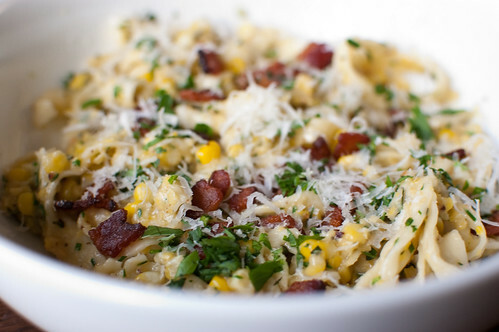 Corn pesto - how did I miss this in my issue? Must try tonight! because yours looks amazing. This looks amazing, Josie. Thanks for sharing! I saw this in the magazine and fell. In. Love. Why haven't I made it yet? That is the question. 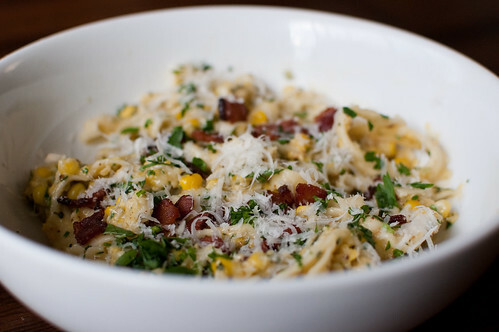 i'm totally intrigued by corn pesto... i bet its amazing with homemade pasta! Mmmm love corn so I know I'd love this! I think I have died and gone to heaven! All of my favorite things in one little bowl of goodness, I am making it this weekend no doubt! I have never heard of making pesto from corn, but it sounds delicious. Yummy! This looks absolutely amazing. I've never heard of corn in pesto... I am equal parts puzzled and intrigued! I bookmarked this very same recipe! What a brilliant idea. I made this as quick lunch at the beginning of this week and have been craving it ever since! I can't believe I've never tried corn pesto before! It's uber delicious! I made this tonight with a few adaptations to our preference (used pecans, asiago and cilantro). It was soooo good! I would love to try this one! What a very interesting dish this is. Thanks a lot for sharing.